Japan a country famed for its forward thinking take on the modern world. The things that come to my mind at least when I think of Japan are things such as cosplay, anime (comics) and the latest technology but not football. Well that was until I looked in a bit further into their history of the beautiful game. So how is Japan taking to football in such a way from a nation that had never even been to a World Cup till 1998. Before looking at what happens on the pitch the fans also played a part in this. Back in the 80s and 90s Japan major sport was baseball and their football crowds where very low. 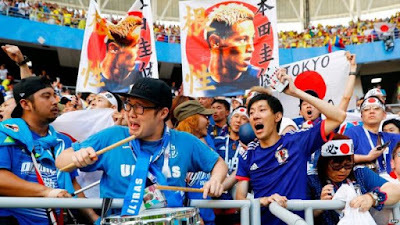 However, something happened that you think of happening more across Europe and South America and that is a football ultra-group was started in support of the Japan national side. The term ultra has many negative and positive connotations but what this basically means is a group of fans that like to make has much noise as they can to cheer their side on. This is something that I certainly wouldn’t think of straight away being part of Japanese culture. I would be wrong however as the Japan national side have a very keen and loud ultra-following. How did the side become successful on the pitch then? Back in the 80s and 90s Japan didn’t have a strong national side and struggled to bring in the crowds compared to now when they have up to 500,000 people applying for tickets for one international match. In the early 90s a man by the name of Tom Byer an American Coach came to Japan to change the game. He was the first foreign coach to come to Japan and helped to transform the game by teaching football from the grassroots to the top level to help develop more technically gifted players one of these players Tom found was Shinji Kagawa of German side Borussia Dortmund. His coaching helped more people get into football in Japan as they also created the J League a national football league. Something else big happened of course that Japan made a joint bid for the 2002 World Cup which of course they did co-host. All of this combined seemed to energise the game in Japan and the country that had never been to a World Cup qualified for its first in 1998, it then co-hosted the next World Cup in 2002 with South Korea. Now when Japan travel to Russia this summer it will be their 6th World Cup in a row showing just how much the games changed. The country as a chance of getting to the knock out stages of the World Cup for the first time since 2010. I am sure also their fans will be there in full voice. I for one am very excited to see how they do get on in Russia next summer.